Missy's Views : Summer Splash $2500 Total in Prizes!! Giveaway Ends 6/25/18 5 Winners!! 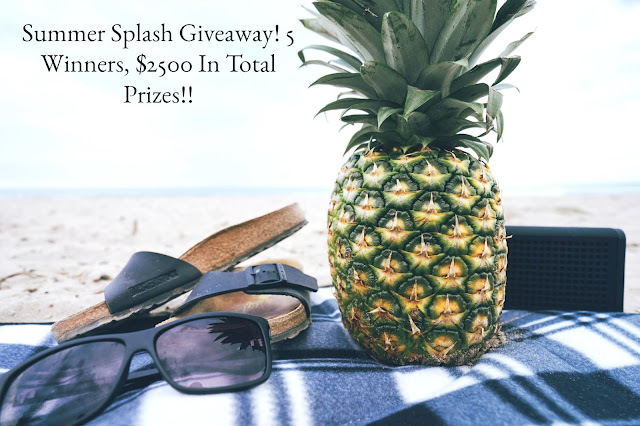 Summer Splash $2500 Total in Prizes!! Giveaway Ends 6/25/18 5 Winners!! Welcome to the Summer Splash $2500 Giveaway! Five lucky winners will receive $500 Paypal cash or an Amazon gift card! Terms & Conditions: Giveaway will open on 5/25/18 @11:59PM EST and end on 6/25//18 @11:59 PM EST. There is one mandatory entry with multiple bonus entries. Only the mandatory entry needs to be completed in order to win, however, the more bonus entries completed the more chances you have to win. There are daily entries as well. Must be 21 years or older to win. Five(5) winners will win $500 Paypal cash or Amazon GC. Entrants must complete entries and each winning entry will be verified. If the selected winner does not complete or verify entry a new winner will be chosen. Winners will be notified no later than 6/30/18. Winner will be emailed and must respond to claim the prize within 48 hours via the email they signed into the widget with. If the winner doesn't respond within 48 hours a new winner will be chosen. Once winners have claimed prizes they will be announced on the Winner's Circle page and sent to co-hosts https://wp.me/P62VRh-26y . Void where prohibited.